Wave has come a long way since 2010 as a free, cloud-based program. Now supporting 2.5 million users, the software provides free standard features, with a visually pleasing interface. Tools include billing/invoicing, estimates, expense tracking, and advanced sales tax settings. Available on Android and iPhone, Wave has added extra features for contact management, bank reconciliation, and lending. Used by both small business owners and accountants, Xero offers over 500 tools to provide customization for company needs. Supporting multiple currencies, Xero revolves around handling payroll and payroll taxes. Optimized for collaboration between users and accountants, data is processed through a single ledger. Users can speed processes by creating invoices via preset templates, or by sending billing or invoicing statements directly online. Suited for small businesses, SlickPie’s cloud-based platform brings an invoicing feature for online billing and document management with pre-set themes. Financial reports provide users with business growth analytics, and automates invoicing and payment reminders. It’s free to use, and provides an additional free tool called MagicBot for automated data entry. Commanding as one of the most recognizable software applications, QuickBooks offers both licensed and online versions. Invoices/billing can be electronically sent to customers, and accountants can find collections, fixed asset management, and cash management tools helpful. QuickBooks provides a 30-day free trial to see if it matches company needs. Available on iOS and web, Kashoo’s cloud-based accounting software is priced at $12.95/month (free trial available). Online training webinars as available as well as support during business hours. With the ability to track expenses and income, users can invoice customers online and access payroll and tax management features. Kashoo stands out for its ability to deal with multi-currency expenses easily. Popular amongst small to medium-sized businesses, Sage 50 include features for accounts payable, accounts receivable, bank reconciliation, and cash management. The payroll and employee management features makes it a unique option amongst competitors. Priced at $29.95/month. 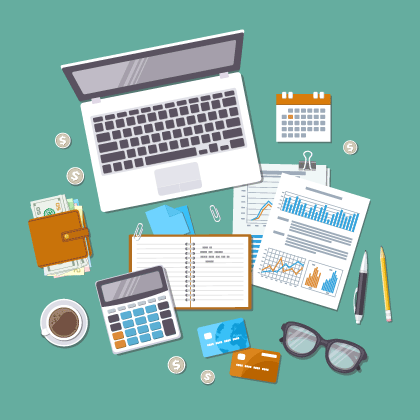 Which accounting software programs are best for my business? Start with free trials and find your optimal comfort level. It helps to obtain a list of requirements from each of your stakeholders so you know what to look for. Reviews online can be helpful, but view them objectively. Finally, remember to consider tools that other businesses in your industry are using.